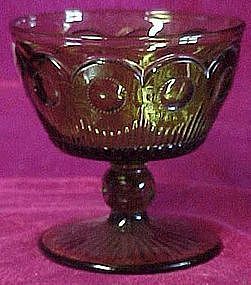 Footed green sherbert, or dessert dish, discontinued in or about 1967. Manhattan pattern by Bartlett Collins (originally by US Glass). Pattern is a bullseye and cane design in a pretty avocado green color. Measures 3 3/4" tall. Perfect condition. 2 available.